This tiny, green-brown to grey foliose lichen can look like little drips of melted skin when seen on the bark of shady, nutrient-enriched wayside trees. The thallus — about the width of a one-cent coin — is tightly affixed to the substratum, but when many individuals occur together they can join to form larger, continuous patches. The lobes appear finger-like only towards the tips. 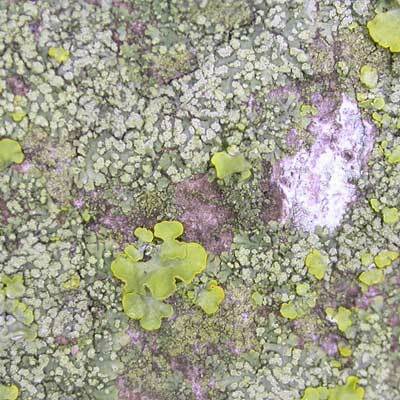 Tears in the thallus cause powdery soralia to appear at the surface, sometimes obscuring it. Discs are not uncommon, red-brown in colour. It is a frequent coloniser of the ‘canine zone’ towards the base of trees in urban and suburban situations and is widespread, especially in eastern and central Ireland. On shaded, nutrient-enriched trees and walls; elder especially is favoured. Simms, M. J., (2016). Hyperphyscia adglutinata (Flörke) Mayrhofer & Poelt. [In] LichenIreland.